Cut beef into 1 inch squares, add 1/2 tsp. salt. Chop onions and brown in shortening, add beef and paprika. Let beef simmer in its own juice along with salt and paprika for 1 hr. on low heat. Add water, diced potatoes and remaining salt. Cover and simmer until potatoes are done and meat is tender. Prepare egg dumpling batter. Into a soup pot containing 1 1/2 quarts of boiling water add fresh or frozen sour cherries and granulated sugar. Stir and cook. In a separate bowl mix flour, sour cream, salt and beat until smooth. Add to flour mix, 1 cup of hot cherry sugar mix. Stir vigorously. Now add the flour, sour cream and hot cherry mix into the pot of hot soup, stir well and simmer for 5 or 6 minutes until it thickens. Cover the soup and let cool. Keep cover on while it chills in refrigerator and it will not form a thick skin. Serve very cold. Remove chicken, add sour cream to drippings in pan and mix well. To thicken gravy, mix into a paste 1 Tbl. soft butter with 1 Tbl.of flour and stir into drippings. Mix sour cream, sugar, salt and yeast. Stir until yeast dissolves. Add eggs, softened butter and half the flour. Mix well and add rest of flour. Turn dough out on floured board and knead until smooth for about 10 to 15 minutes. Place in greased bowl. Cover and let rise in warm place until double in bulk for about 1 1/2 to 2 hours. Punch dough down. Turn over and let rise again for 45 minutes. After second rising, form into walnut-sized balls. Melt butter in small cup. Dip each ball in melted butter and roll in sugar and walnut and cinnamon mixture. Place in layers in 10-inch greased tube pan. Sprinkle any remaining sugar-nut mixture or melted butter over the top layer of balls. Cover pan with waxed paper and towel and let dough rise again 45 minutes. Bake 40 to 50 minutes at 375 degrees or until golden brown. Run spatula around sides of coffee cake, and invert onto plate. To serve, break coffee cake apart with two forks. Cook the potatoes in boiling salted water. Peel them and immediately mash them. You should have about 1 1/2 cups. Cool. Mix the warm milk with the yeast and sugar. Let the starter sit for 5 or 10 minutes. Mix mashed potatoes with flour and the salt. Start with 1 1/2 cups and add more flour to make a kneadable dough. Knead dough well. Put dough in a bowl and cover. Let dough rise in a warm place until double in bulk. About 1 hour. Roll out the dough with a floured rolling pin on a floured board to 1/2 inch thick. Cut into rectangles, squares or circles. Prick with a knife to keep big bubbles from forming. Melt Lard in a frying pan so it is at least 1/2 deep. Fry Langos over medium heat. If the lard is too hot they will burn, if the lard is to cool the Langos will absorb too much lard. You will have to watch them. Let them get a nice color. When they are done, rub each Langos with a cut clove of garlic and sprinkle with salt and Paprika. Serve warm. Our contact person changed. Agnes Vincze was replaced by Norbert Nagy because of a one-year long break of the former. We informed the other teachers, the pupils and the parents about the project. We organized a project meeting in Budapest, Hungary in November for the participating countries and those countries which will possibly participate next year. We hosted 16 teachers and 5 students. We connected our annual Health Day at school to the project. That day students made and tasted healthy or so called ‘reform’ food, listened to lectures about healthy living including healthy nourishment, and organized sport activities in which some of our guests participated. 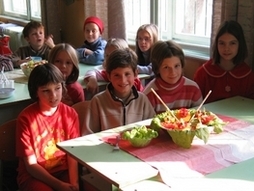 Our guests could get acquainted with the Hungarian school system, Hungarian food and school food and our capital city. We asked our students in the project to fill the Questionnaire. One for weekdays and one for weekends. We participated in another project meeting in Bremen, Germany in March with 5 teachers and 4 students. Beside working on project problems we got information about the German school system and the city of Bremen. We took a sample of the diagrams describing the Questionnaire results with us for format discussion. Project schools chose their favourite types, then later in Budapest we created the common format. We summarized the data of the questionnaires and transformed them to percentages to make the future comparison and analysis easier. For those who sent us their results we filled the diagrams for the others we sent a sample. We made a logo contest for the project but the result was unsatisfactory so we decided not to publish it and also decided to repeat the contest next year. 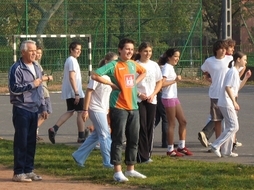 We sent the list and the photo of the participating students and teachers to the common homepage. 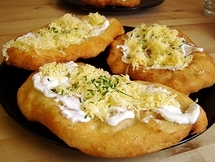 We created a Hungarian traditional recipe book with 9 recipes including pictures. Three soups, three main courses and three desserts. We added our part to the common dictionary. Then we created two temporary formats: one for handing out to the students (4 pages) and another more elaborate one to be printed as a poster. We sent these versions to the coordinator for approval. There is one planned thing we didn’t do. We couldn’t put the project work to our homepage. The reason is: our supervisor and creator of the page refused to do his task anymore and even wants to put an end to the homepage. Next year we will create a homepage on our own and remedy this omission.